Hi Danita.. i found you via my buddy Pam O. Good for you, going to the movies solo! Was it a matinee? The theaters are more civilized then :) Hubby and I do Netflix at home. Last time we went to see a mainstream film (LOTR) some annoying person had a lazer pointer darting around on the screen, after that I said "never again" for going to theaters, lol! I went to two movies in a row once, when I had a few hours to spare in a strange city... I was really worried and scared but was really quite ok. I too am bitterly upset about the Harry Potter delay. I hope July is the world wide release otherwise it will be ages before it gets to New Zealand. 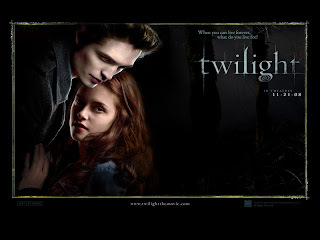 Am looking forward to seeing twilight when it gets here. I think we get it on boxing day. Yo todavia no he visto la pelicula pero seguro que voy este viernes. Vos sos como mi hija que ve las peliculas que le gustan mas de una , dos, y hasta tres veces. Hablando de otra cosa, tus cajitas de la Frida me gustan mucho. Puse un bid en la nueva que tenes en ebay porque la otra alguien me la quito, pero de todas formas me gusta mas esta. Yo tengo una rifa gratis en mi blog de una cajita de la Frida, si queres poders participar. I have gone to the movies several times by myself. It is kind of fun huh? I usually go when it's a "Shonna movie" (one that only I want to see, usually a period piece). I also saw Twilight and was very pleased with it. So many times the book is sooooo much better that the movie is very dissapointing; but not in this case. Love your work!!!!! Welcome to the club. I have always been a fan of solo movie going. Even before I had kids. I would sneak away during the day, such a guilty pleasure. Hello Danita! I really enjoyed visiting your blog. I just love your artwork! My daughters (19 and 20) just saw that movie too, after reading the books. They are so in love with Edward! ha ha They were also Harry Potter fans. and so great not to worry about multiple seeats together!